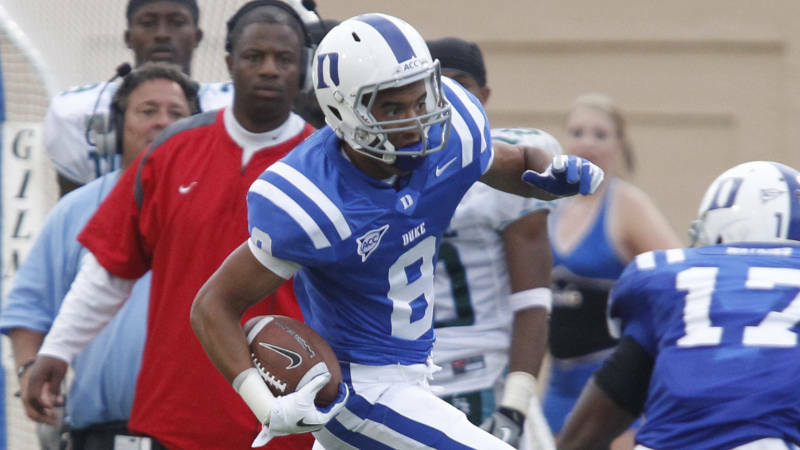 DURHAM, N.C. – A trust endowment in the name of critically injured Duke wide receiver Blair Holliday – titled the Blair Holliday Recovery Trust – has been established to assist the family with medical and rehabilitation expenses. 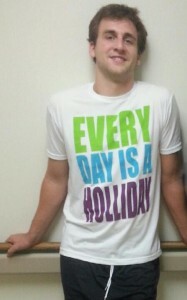 Checks made out to "Blair Holliday Recovery Trust” may be deposited at any Bank of America nationwide. Interested donors should indicate to bank officials that they would like to make a donation to the Blair Holliday Recovery Trust addressed in California. In addition, checks made out to “Blair Holliday Recovery Trust” may be mailed to P.O. Box 90559, Durham, N.C., 27708, with attention to Peggy Nelson. “God continues to amaze us through Blair each day,” said Leslie Holliday, Blair’s mother. “Glimpses of Blair's personality are emerging. Blair fist bumps teammates and responds with a head nod when asked questions. Blair recently smiled while hearing his Dad's voice over the phone. We feel blessed that Blair has been given the opportunity to transition to Shepherd. We have mixed feelings about taking NSICU's "Baby" to Atlanta, but we know it's in Blair's best interest. God has opened so many doors and opportunities for Blair's full recovery. 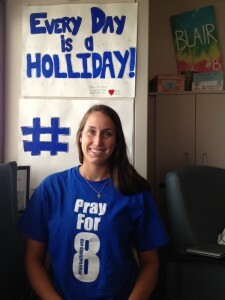 Our family will continue to provide updates related to Blair's condition and ask that you continue to #PrayFor8. A native of Sherman Oaks, Calif., Holliday was injured in a watercraft accident on North Carolina’s Lake Tillery on July 4 and remains hospitalized in Chapel Hill, N.C. Next week, Holliday is expected to be transported to the Shepherd Center in Atlanta, Ga.
Shepherd Center (shepherd.org) is a world-renowned rehabilitation hospital, specializing in medical treatment, research and rehabilitation for people with spinal cord injury and brain injury. A private, not-for-profit hospital founded in 1975, Shepherd Center is ranked by U.S. News & World Report among the top 10 rehabilitation hospitals in the nation. Holliday will be admitted to Shepherd’s Acquired Brain Injury Unit. On Sunday, September 30, the Lucky Strike bowling alley located at 6801 Hollywood Blvd., in Hollywood, Calif., will support the Blair Holliday Recovery Trust by hosting a fundraising event that includes 90 minutes of bowling including shoe rental, soft drinks and pizza for $40. For more information, call Lucky Strike at (323) 467-7776. Leslie Holliday continued, “We believe Blair would like to share the following message as he had it tattooed on his right upper arm: Enter through the narrow gate. For wide is the gate and broad is the road that leads to destruction, and many enter through it. But small is the gate and narrow the road to life, and only a few find it. Matthew 7:13-14.